It’s time to break away from unhealthy traditional dishes. ​For flavor, use spices to replace fat! Heat the olive oil in a frying pan/skillet over medium heat. Add the minced garlic stirring often until garlic become translucent. Add mushrooms and spinach. Sauté for 2 to 3 minutes until the spinach has wilted. Remove from heat. Discard extra juice from frying pan. Add mozzarella cheese and mix well. This is the spinach cheese filling. Spread spinach cheese filling on top of a tilapia filet. Place another tilapia filet on top. Should look like a sandwich. Place in the pre-heated oven for 25 to 30 minutes. You can cut the tilapia "sandwich" in half for a serving. 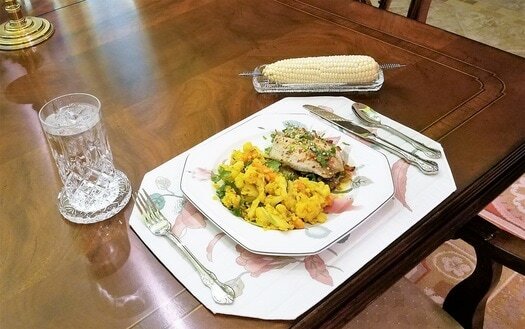 Note: The secret to the dish is to season the fish at least a 1/2 hour before cooking to start developing the delicious light flavor. Heat oil in a skillet. Add onions and continue cooking until the onion is lightly brown. Add ginger, garlic paste, and Cajun spice seasoning. Then add chicken. Stir and cook chicken until it loses its pink color. Stir in yogurt and simmer for a few minutes on low heat. Sprinkle crushed red pepper flakes into the skillet. Cut each pita in half to open pockets. 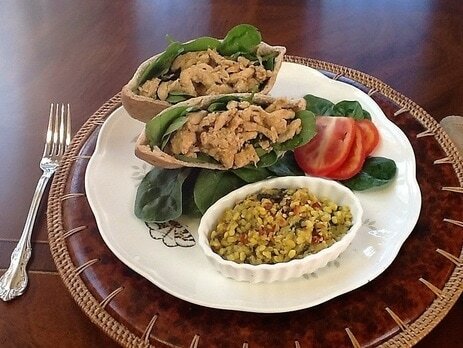 Fill each pita with 1/4 cup fresh spinach and 1/4 cup hot chicken mixture. Heat oil in a skillet over medium heat. Add the onion; cook and stir until the onion has softened and turned translucent, about 5-10 minutes. Gradually add concentrated chicken broth mix, stirring until smooth. Add chicken and cook, turning a few times. Add salt, pepper, and tarragon leaves. Cover and cook in slow heat until fork can be easily inserted in chicken. Stir yogurt and pecan or walnut. Cook until sauce has thickened slightly and oil droplets start to rise to the surface (about 15-20 minutes). Place chicken on serving platter. Sprinkle grated parmesan cheese on chicken.